Bertha Blanco in the office of the National Federation of Campesina Women of Bolivia, in La Paz, Bolivia. In the background is a portrait of Bartolina Sisa. She is holding the indigenous Wiphala flag. Further in the background is Tiwanaku art. (Click to see larger image). All photos by Nic Paget-Clarke. Dancing and marching through downtown La Paz, women from different neighborhoods of El Alto and La Paz support women's rights to education, to read, to write, to overcome poverty. (Click to see larger image). 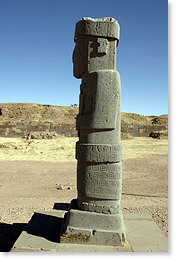 A statue (thought to be of a priest) of the ancient Tiwanaku civilization. Kalasasaya, Bolivia. (Click to see larger image). 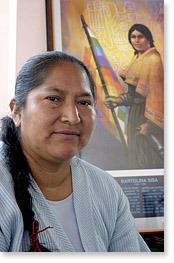 Bertha Blanco: Bartolina Sisa was an indigenous woman who, along with her husband Tupac Katari, worked for the rights of the indigenous people, and she was assassinated two hundred and twenty-five years ago. He was decapitated by 4 caballos. Bartolina Sisa was hung, but, before she was hung, they cut out her tongue as a warning to all indigenous women that they should not meddle in political and social issues such as the defense of their race. However, at the time of his death Tupac Katari left some words: I am dying, but millions shall follow me. For us it is like a utopia of two brothers, a couple who gave their lives for the defense and rights of the indigenous peoples. At that time they were considered to be just beasts of burden. It was like the feudal era when there were just masters and slaves. Our race and our class were used just as slaves for those masters who had appropriated everything, our territory, our natural resources and our work. In that way they crushed and subjugated our culture, our identity and our traditions. As time passed, politics and economic interests changed. The feudal lord was not as important, as the industrial revolution influenced the entire world. 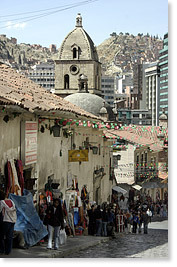 In Bolivia, mining began being developed as a source of financial revenue. The feudal lord no longer lived off the land, but from mining. Bolivia became the second largest producer of tin in the world, but the income generated by mining has once again been appropriated by a small group of economically powerful Bolivians, the Spanish and their descendents who are not of our race. It is this small group, this race, which has been appropriating the land and the natural resources and concentrating economic and political power through the subjugation of the indigenous through enslaved and forced work. Within this context of slavery, another important moment came with the agrarian revolution in 1952, with calls for freedom for the right to vote and the right to land, using the slogan the land for the one who works it. But they did not hand over the land, they only said "for the one who works it", giving small parcels to the campesinos, not all the land that belonged to us. At the same time, the revolutionary movement also began being manipulated for political ends. But the bosses, beginning with the industrial revolution, began to have other interests, and they became involved with the exploitation of tin and oil, controlling everything through monopolizing politics. 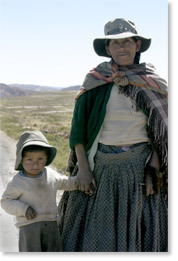 The Andean people developed on, and had control of, three ecological levels. The altura is where they produce potatoes, oca, quinua, cattle and meat. The second level is the valleys, with other kinds of food such as maize, beans, green beans and grains and, lastly, the warm valleys, where coca leaf, plantain and yucca grow. The Andeans have always moved between the three ecological levels throughout the year in order to exchange and barter products. This was the way of life for the Andeans. But with the arrival of the Spaniards, this control has been reduced to a limited use of the resources since the land was divided up into plots. The indigenous peoples could not gain access to political spaces, and they only used us as voters. It was the same with education, which was not accessible in the countryside because the universities, colleges and schools were in the city. It would have been impossible for a Mamani (Abel Mamani, Minister of Water) or a Quispe (Felipe Quispe) to get in, it was prohibited. Study and education were just for an elite of society, those who lived in the city. They considered the indigenous as pack animals, a labor force, and if there were a teacher for the countryside it would be the same one for all of primary education, the second to fifth years. In the case of women, it was unthinkable, since they were thought of only as servants. Little by little, organization was being consolidated in 1952 and more strongly in the 70s when we went through a period of military dictatorship, even though when there is a military dictatorship and a state of siege, meetings and assemblies cannot be held. There have been times, however, when the indigenous people have risen up with more force and demanded their rights. I remember the history of the organization since I was a child, and it has always been about death and massacre for our race. We cannot continue living like this. Although, ome of us have managed to educate ourselves at a college -- we have managed to break down the barrier that education is just for a few and not for everyone -- a large percentage of campesina women are still illiterate. Also, they do not exist, since they have no documentation, identity cards, or birth certificates. I believe the politicians have done that on purpose so the people's rights can be usurped by just a few, in order to exploit and appropriate this country. If people do not have an education, they do not know their reality, and they know even less about their rights and the laws which protect them. During the period of the dictatorship, the organizations began reorganizing in the communities and in the cities in order to defend, to confront, and to seek a democracy in order to live with dignity. Beginning in the '70s, more or less, the men began organizing, but so did the women, because when they mistreat men, the women also rise up, in an organized way, for defense. The violence of the dictatorship, by the de facto military governments, has led us to our peoples organizing ourselves more strongly in the communities. That is how the organization has emerged at the departmental level and the national level. Among the results of repression was the wounding of the first national executive of the Single Union Confederation of Campesino Workers of Bolivia (CSUTCB). He remains in a wheelchair to this day, paralyzed. Our leaders were confined, and they were exiled to other countries. The organizations are fighting for our rights, for land, and territory. First there was the agrarian reform law, where parcels of land were given out. Then there was the other reform law, INRA (National Institute of Agrarian Reform), which said that land is for the one who markets it. Once again the state had the right to sell land, and we don't agree with that. This land is not for selling, but for living on. From this point of view, the organizations have engaged in much resistance against land being sold by the state, by the government administrations. After these outrages, the deceit of the political parties and words like The Indians have no right to meddle in politics, we decided that the indigenous peoples must have our own politics of defense and for the recovery of our national land. Where are our children going to live if everything is going to be sold, if everything is going to be handed over to the transnationals, to the point of our being condemned to being beggars? That is why we women also have to participate with greater responsibility in this struggle, in order to guarantee a future for our children. That is why the organizations decided to build a political arm, the Political Instrument for the Sovereignty of the Peoples in the 1995 Congress, in order to assume political responsibility, to recover our own sovereignty over the land, the territory, and the natural resources. And it was from that point on that we began, along with our compañeras from the communities, from the unions, from the barrios, men as well as women, to inform ourselves and to train ourselves for the recovery of our national sovereignty. We cannot allow them to rob us of our natural resources. There are three Andean rules: Dont be a thief, dont be lazy and dont be a liar. These rules are very important, and they should be respected, if not, where are our people going to work? Pachamama is our Mother Earth. She is experience, she is life. She is living well on this earth, sharing everything that exists in nature, between men and all living beings. Natural resources were made to be shared by this humanity. We do not want, nor do we demand, to live in abundance, but neither do we want to live in poverty. We want to live in balance and harmony. We have to learn to share among ourselves. And what Pachamama represents cannot be eliminated. That is the point of our struggle -- the recovery of well-being, which is how Pachamama wants us to live on this earth. And, if the policies which have been implemented by the neoliberal governments have taken the resources out of our hands, then we are seeking, through our policies, to recover the resources since we have now entered the government. That is why we are contributing all our thoughts, our practices and our Andean cosmovision of what Pachamama means to us into this Constituent Assembly. (Editor: The Constituent Assembly is developing a new constitution which will be submitted to a national referendum). Llama herder Aurora Achonina with Miguel Choque-Acho on the Altipano, Oruro department. 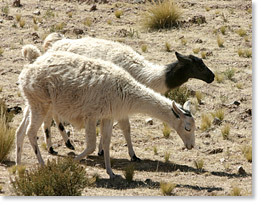 Two of the llamas under Aurora Achonina's care. 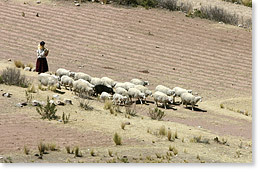 Herding sheep (and one pig) on Kala Uta island in Lake Titicaca. 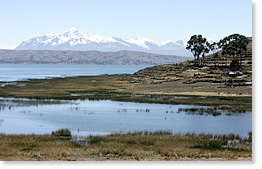 On Kala Uta island in Lake Titicaca looking towards the Cordillera Real range of the Andes, Bolivia. (Click to see larger image). In the city of El Alto. 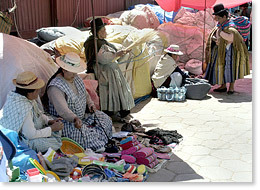 El Alto is a working class community of 800,000 on the Altiplano above La Paz. 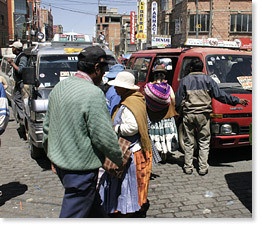 El Alto -- getting on and off colectivo mini-buses. 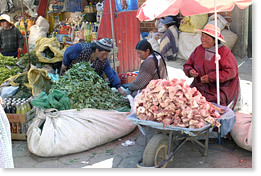 El Alto -- the market: coca leaves and meat. 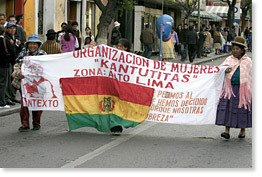 More images of the march through downtown La Paz: women from different neighborhoods of El Alto and La Paz support women's rights to education, to read, to write, to overcome poverty. (Click to see larger image). 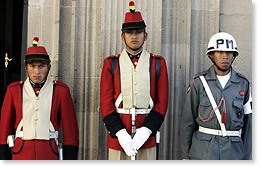 A military guard in front of the Presidential Palace, Murillo Square, La Paz. An important achievement which has contributed to the political participation of women is the legislative proposal presented to the parliament by the compañera Leonida Zurita (former Executive of Bartolina Sisa) concerning the registration of undocumented persons, that is, the campaigns for registration in order to have birth certificates issued. Many women have not been able to participate in elections or been able to make our political proposals known because they do not have an identity card. But neither were we recognized as women in this country. In this way, we were not able to have a party or to be on the voters lists. On the other hand, even though some of us are in power, we have to safeguard the organization, because the right-wing parties can come in at any time, and they can also try to destroy the organization. After six months of the executive branchs work, we are remaining on alert and looking after the organization. Nonetheless, all the problems of the country cannot be resolved in six months. Everything that has been destroyed in the country cannot be corrected in six months. Change cannot happen overnight. The Constituent Assembly was a demand made by the organizations since they were insisting on the inclusion of the peoples in the constitution and in the remaking of the country. That is why the organizations mobilized under a pact of unity. At the present time there are problems in the Constituent Assembly owing to differences between those from the city, the people of the elite, since they do not understand that the indigenous peoples can also participate in a constituent assembly. To them, we are like pack animals, nothing more. As an example, during our executive's first speech, they intolerantly pounded and made catcalls, saying: "That Indian should learn Spanish." She speaks Quechua very well, and she expresses herself very well in Quechua, but she can't express herself in Spanish because it's another language. So we see a lot of discrimination from the right which, even though there are just a few of them in the Constituent Assembly, nonetheless feel as if they have all the power of ownership. It doesn't have to be like that. There has to be inclusion in this country. They cannot and we cannot continue thinking that they are the masters. Everything has to change with the Constituent Assembly, the countryside, politics, the elections. Everything has to change. Before, they were the masters of the political parties, and they made their alliances in order to put in a president without achieving a majority. We have achieved that majority without alliances, with just one party. The party of the indigenous peoples is called the Political Instrument for the Sovereignty of the Peoples, but the National Court has not wanted to give a certificate of participation as a political party. But one person gave us the legal status of a party, the Movement to Socialism. With this we have been able to participate in different elections. This time we won the majority, more than 51%, without the need for alliances with any party, and we gained power. I believe that in Latin America the majority of the peoples are indigenous, and they have to learn to value themselves, not to feel like strangers, but rather as the masters of their own territory. Otherwise, someone in the government can take advantage of being in power and then easily go to the United States or to Europe with his family after appropriating or enriching himself. We cannot do that. We live on this land, which is our mother Pachamama. She has given us these lands in order to live here, so we cannot think, "Ill govern and then I'll leave, but rather, I am governing, but I'm staying." That is why it's important to us to have gained power, even though it's been a very sad victory, because there has been much blood. However, even so, there are many people who want to do damage, and they are doing so inside the executive branch. But we do not want to opt for the path of aggression or violence. We think we have to seek to live sharing with the city, even though in the city there are other ideological thoughts, ways of thinking and living and of conceptualizing life. At the end of the day, it is the countryside which provides the city with food, with its nature, with its livestock and the cultivation of farms. They have not managed to understand that we should live together and distribute resources equitably, for the country as well as for the city. The city has often been unjust with the countryside, but we have a principle, and that is that we are not going to take vengeance, but instead we are going to teach sharing, coexisting and governing together. They do not accept that, as, for example, we have the majority in the Constituent Assembly, and they have began insulting, hitting out, and being rude. What we want is for them to learn respect, because in our villages one always shows respect to those who are older, who are in authority. When someone holds a position of authority in the countryside, one becomes poor again, because you have to serve the organization for free. We have to mobilize all over the country, and we do not have the financial means. Nonetheless we have to comply, and we have to fulfill a duty to the community. It is a service they have to the land, for the right they have of living in that territory. Holding a union position is almost an obligation among us. It involves serving our brothers. If they name you an authority, you have to serve, and no one is going to pay compensation for your service. The position is obligatory for one year in the communities. At the national level, the time period is two years, and a report has to be given about those who are collaborating with us and those who are not collaborating with us. Everyone works in their own way to support themselves. Sometimes we have to go on foot or we have nothing to eat, but we have to fulfill the responsibility of that position. Some compañeros and compañeras are organizing, others are in the Congress, others in ampliados, others are at events. That is how we divide ourselves up. There are almost no people here (at the organizations headquarters). We are always moving, organizing, helping the organization. That is a little of our history. Today, as a woman's organization, we are still engaged in struggle. At this time, the Constituent Assembly is very important. Our executive compañera is carrying out a very important role, there in the Constituent Assembly, because everything we've been working for must be made real. We do not want this country covered in blood any more. Never again, we want it to end forever. When people demand a right, march, when they go to a march, there are bullets, and it has always been like that. Now we do not want violence ever again, because the world is not conquered through violence. Here there must be sharing. If there is poverty, then we have to share poverty. But we cannot be covered in blood any more, that has ended. Others are now aspiring to our resources, and they are going to put in a lot of money in order to cover us with blood, but here the peoples do not want blood. We do not agree, it is not part of our way of life, nor of our identity itself. Death, only Pachamama gives us that. She takes it away from us, but man does not have the right to take it away. We have said that we have to fight hard in the Constituent Assembly so that the others understand that we do not want to exclude. Instead, we want the inclusion of both parts, the city as well as the countryside. We have to learn to coexist. And the laws have to include the feelings of the indigenous peoples as well as those of the city. We cannot deny them, but nor can they deny us. Currently, and shamefully, the small group PODEMOS (Democratic Social Power), which is a group of citizens still from the elites, has hit out at our compañera. We have said that order must be imposed, like in the communities, with the whip which is a symbol for being able to discipline within the organization. And so we have given the whip to the compañera Isabel so she can impose order there. She is not just any assemblyperson. She is the national executive, and, as a mother, she has to be respected and to impose order. She is not just an assemblyperson, she has another position. She represents a district, she was elected there. But she is also responsible at a national level for all women through the contributions of the organizations for the Constituent Assembly. And, since we have worked through departments, all our contributions and traditions should be represented in the Constituent, and there should be a national regulation. Concerning the issue of education, it should be for everyone, so that our children don't leave just as high school graduates, but so they can leave as technicians and also be able to work. At the same time, we want our entire Andean cosmovision to be included in the new books in the schools so our children will know and practice them from the time they are little and so our children will learn in school everything about our identity. On another issue, our traditional medicines. Our world has other kinds of illnesses, and they are cured with other kinds of medicines which have always been rejected by Western medicine. For example, some illnesses which are recognized here are never going to be cured by a doctor. Only a Kallawaya will recognize it, because it is an illness which is here. This has always been rejected, and now we want it to be recognized within the health care system. In a similar fashion, everything having to do with recovering national sovereignty and natural resources, we want to get everything back and for there to be certain restraining regulations for protection and so that a new government does not come in and sell off all our resources. That is why we need the indigenous organizations to have a lot of power, so that our natural resources are not sold off. That is why all these proposals are being carried out and are being debated in the Constituent Assembly. Unfortunately, the other group believes it is the master of Bolivia, master of the territory, master of the resources. We think that, since it is a small group, they want to do whatever they want, and it cannot be like that. Since they do not want to understand that the indigenous peoples also have all the rights and power over this territory, the fighting starts with the right-wing when they try to impose themselves and feel themselves to be masters of our natural resources. Since this territory belongs to the indigenous peoples, it is for the future of our children who are going to live, and we are going to fight for that. But if they do not feel good about our proposal, what are we going to do? We know that their children are going to live abroad, and if they go that means they are not interested and they have no reason to lay claim. We are demanding the sovereignty of our land, that it be maintained, cared for and protected. That it not be exploited commercially, but in a regularized manner as needed. We do not want great wealth, but nor do we want to be beggars. We should work, and whoever works should have enough to eat in dignity. We want our regulations to be observed. And not with the growth of capitalism where just a few grow and believe they are masters of Bolivia while the rest, the people, die of hunger. We do not want hunger, but dignity. That is why we women are fighting. The nicest thing is that compañero Evo is president of the Republic and compañera Silvia Lazarte is president of the Constituent Assembly. She is the former executive of the Bartolina Sisa Federation. Isabel Domínguez is our current executive, and she is in the Assembly handling our proposal. I believe that, as women, we have struggled and suffered a lot. We feel validated through our participation as women. Because before having other ambitions, we are mothers first, and we have to see to where our children are going to grow up. That is why we are persevering in the struggle to protect all our natural resources. Because of the need for land, many brothers have gone to secure lands in the east. 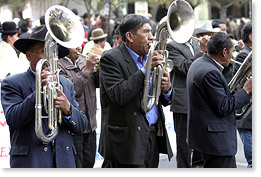 There was, for example, a massacre in Panananti (November 9, 2001) where nine campesinos died seeking land. It's etched in my mind because they were compañeros from communities who were evicted from their lands by a company that came to exploit the mining. They opposed it, and there were more than 5 deaths. In the War for Water there were also deaths, in the war for gas, how many? 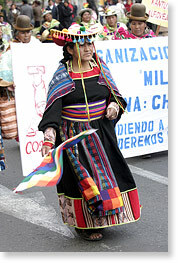 More than 60 or 80 deaths in El Alto, for defending natural resources, resources which are important for us. We are so rich in resources and so poor, without housing or infrastructure, in the countryside. Why do we want that if we have nothing, if we are poor? Why are we going to give away our natural resources? We would prefer to have them ourselves, to safeguard them for a future. We are tired of blood. When blood is spilled, it is our race, not any other race. It is not those from the city who die. They are miners or campesinos, those are the ones who are going to be killed. We can't kill each other. During the War for Gas they made the mistake of killing six persons in Warisata. The people couldn't tolerate one or two people dying, and that is why the whole country rose up. We are not violent people. We are working people who go to great effort to work and to earn our daily bread with dignity. And so, if we see one or two people die, it hurts us very much, and we all rise up. We don't care about work; we don't care about anything. We go out into the streets in order to defend and to prevent more people from dying. We do not like violence. We like to live in peace and to have good work. But if they touch one of our brothers, we cannot stay like that. You can see the mobilizations that took place in Santa Cruz, Cochabamba and here. In our culture you have to sacrifice in order to live well, in order to eat well. That is our way of life. But many people push us to violence. 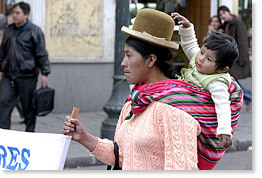 But we remain standing, as they say and teach in El Alto. During the gas war, we always said El Alto standing up, never on our knees. It is a nice slogan because we should never get down on our knees in front of anyone. Because one has to live with dignity in everything, wherever we are. And we Bolivians are most expert at organizing. We have our organizations. We are always organizing. We women have our mother organization, the Bartolina Sisa National Federation, with its leaders and its beliefs about the defense of our identity. When we came here we had to carry out our duty, which has been left to us by our ancestors. As Bartolina says, women and men must organize ourselves in order to defend our people, our identity, and our way of life. And that is how we are.